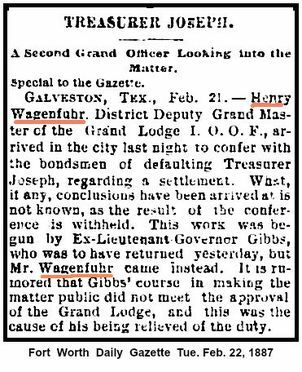 PGM Henry Wagenfuhr's became the Columbus Fire Chief. 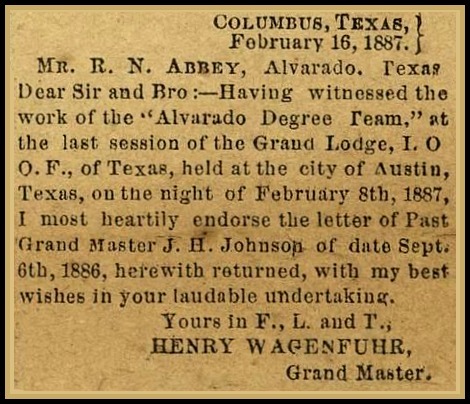 The above photo is entitled “Columbus Fire Company greeting. 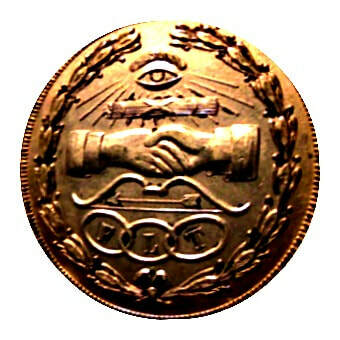 It is possibly the Columbus Cornet Band meeting the train of gubernatorial candidate John C. Ireland in July 1882. 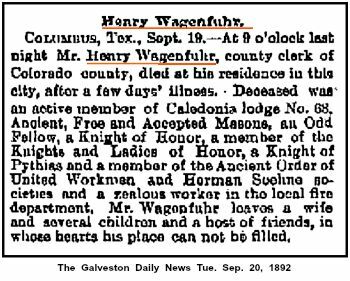 With profound sorrow the CITIZEN announces the death of Mr. Henry Wagenfuhr, county clerk of Colorado county, and one of the most prominent and useful citizens of Columbus. He passed away at 9 o’clock last Sunday night, of a complication of diseases, the heart, liver and kidneys being affected. 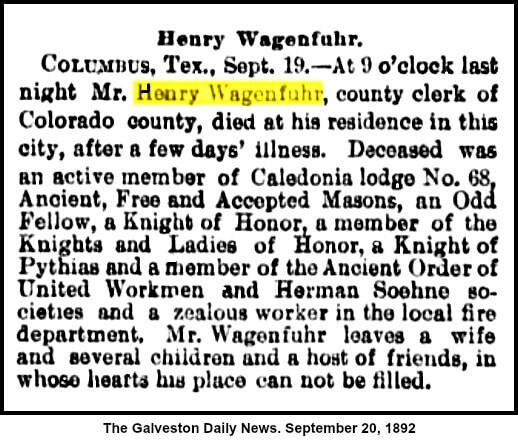 Henry Wagenfuhr was born October 7, 1848, at a small village called Rohden, Prussia, and came to Texas with his parents in 1850, settling at New Braunfels, Texas. 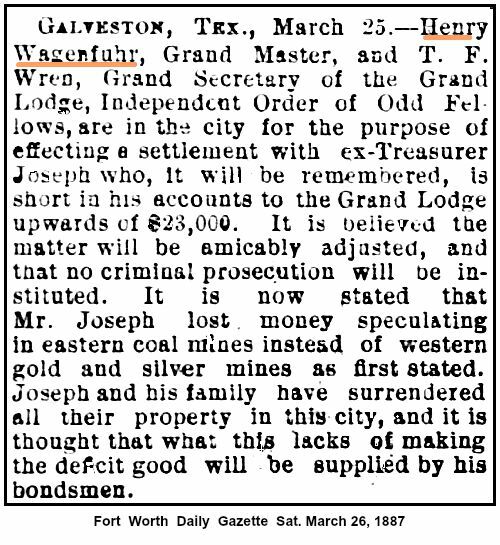 He resided there with his parents until he was twelve years old, receiving only three years schooling at the public school at that place. 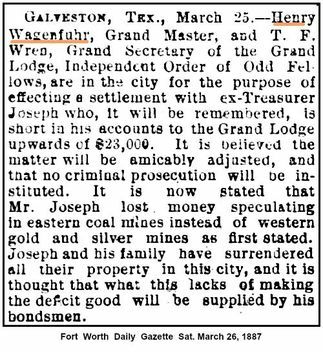 He then started out in life on his account, serving an apprenticeship at the saddler business, and worked at the trade for four years in New Braunfels and Columbus, and at various other callings. 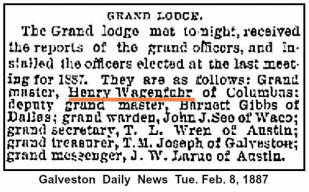 In 1869 he became Deputy Postmaster at Columbus, Texas, in which capacity, in connection with clerking in a general merchandise store he acted until December 1872. 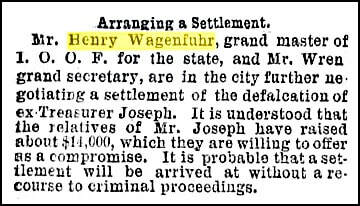 On the 17th of December, 1872, he was sworn in and acted as Deputy District Clerk until April 18, 1876, he having been elected County Clerk February 15, 1876. He qualified as County Clerk April 18, 1876, the duties of which office he has since continued to perform, through election by the people, which is a sufficient commentary upon the satisfactory manner in which those duties have been discharged. 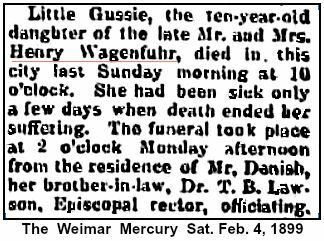 March 19, 1873, he was married in this city to Miss Henrietta Kulow, who, with five children survives him. 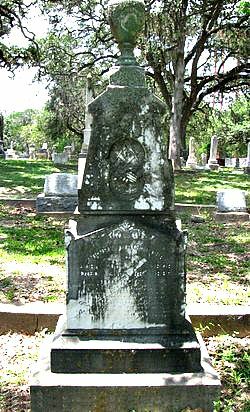 Located at Odd Fellows Rest Cemetery in Columbus, Texas.